One of my responsibilities as a national officer of my sorority, is to travel across the country and facilitate leadership trainings for collegiate women. Last President’s Day weekend, I was scheduled to facilitate a conference at the University of West Georgia. At the time, I was talking a lot to a guy who lived in Atlanta, so I decided to extend my trip to Georgia under the belief that he and I would spend a good chunk of time together. I took the earliest flight that Friday from Denver to Atlanta, believing that we’d spend the day bopping around Atlanta and then I’d get in the car and drive to Carrollton (where UWG) is for the night. I’d finish up the leadership conference on Saturday afternoon, head back to Atlanta and continue sightseeing with him until Monday. Such was the plan, at least. Given how early my flight out on Friday was, I opted to just text him before the airplane took off. “See you soon!” When I landed in Atlanta, I expected to turn on my phone and see a text message from him welcoming me to his hometown. Instead, there was nothing. And in fact, there was nothing ever again. Save for an awkward exchange regarding some flowers on my birthday, but that’s another story. For the time being, though, I was disappointed, confused and in a place I had never been before. Alone. And with a lot of time to kill. I’ve never been one to sulk for long. So when I clearly recognized what was happening, I was determined not to let his actions ruin my weekend. I created a “back-up” plan of sorts. And now, nearly a year later, I can truly understand why things happen the way they do. At the time, I was taping a weekly segment on a show on a Birmingham sports radio station. The co-host, Rachel Baribeau, had reached out to me in November to see if I would discuss legal issues on the show. As I meandered through baggage claim, I Mapquested the distance between Birmingham and Atlanta: 2.5 hours. Seeing that it was about 11 a.m. and I didn’t need to be in Carrollton until 7 p.m., I asked Rachel if I could meet her in Birmngham and tape a segment for the show in-studio. Graciously, she said yes. I grabbed my bags, picked up my rental car and headed west on I-20 to take my first trip ever to Alabama. Thirty minutes outside of Atlanta, I realized I was hungry and had no idea where to stop along the interstate for food. So, as I do so often these days, I sent out a tweet and asked my followers for recommendations. One of the followers to respond was Brent, an athletics director at the University of Southern Mississippi. He provided me with some good lunch spots that were both delicious and on my route. After eating, I made it to Birmingham with enough time to join the last hour or so of Rachel’s show. Connecting with her in-person was a true blessing, as since that day, she has served as a mentor to me. A couple of weeks after we met, I told Rachel about how a former producer from Regis and Kelly told me that if I wanted my career to go anywhere, I needed an agent. Without any hesitation or me asking her, Rachel said, “I love my agent! You should contact him!” I never actually reached out to my agent, Matt, for fear that he would turn me down and also being unsure of what to say. I mean, “Hey, I have a sports law blog and zip television experience; do you want to represent me?” didn’t sound like too legit of a way to start a conversation. However, a few short weeks after my and Rachel’s conversation, Matt contacted me and asked if I was represented by an agency. Today, Matt and CSE represent me for my media work. One of the people who saw my and Brent’s tweets about where to eat on I-20 was Ryan, who had just begun work as an athletics director at the University of Denver. Seeing that I lived in Denver, Ryan followed me. Upon seeing that he worked at DU, I followed him back. In the following weeks, we would meet over lunch. Over the last year, Ryan has been my listening ear when it comes to talking about where this path of mine is going. Over dinner or drinks, we often sit and discuss our aspirations, dreams and goals. His positivity and our similarity in interests have been refreshing. During one of our pow-wow’s, I told him about how my agent said it’s critical for me to get on-camera experience in order for me to land a job. Ryan said, “How can I help?” At the time, I really had no idea how he could help. However, after hours of conversations and a handful of meetings, we finally figured out how he could help. Today, I taped my first segment as the host of the University of Denver athletics department’s “Pioneer Minute.” My hosting duties allow me to interview student-athletes representing all of DU’s sports in a manner which allows DU fans to get to know them on a level outside of athleticism. 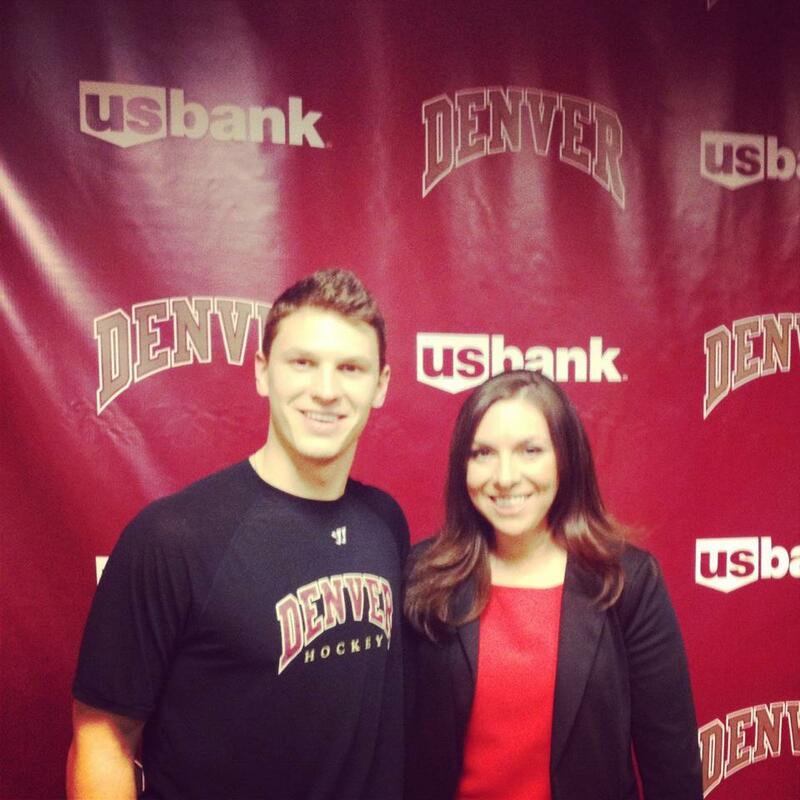 As someone who grew up attending DU games, it is as though my life has come full-circle.